Very easy to deal with Chinese company, good customer service, understood my needs, able to customize, and 7 day delivery once TT received. Well priced also, about USD400 each approx . 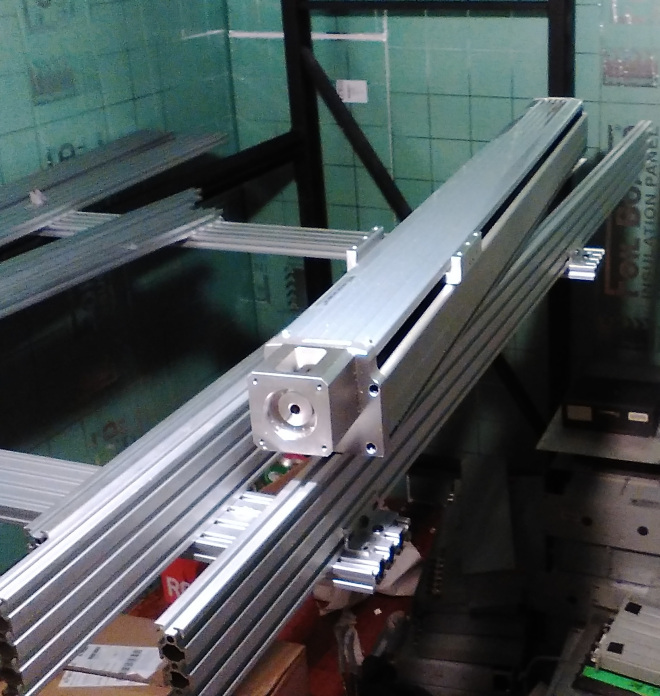 Photo is before the mounting plates go on to interface the rails and the extrusion. Well I think I went a bit too big ! NSS95 for the dual X rails and a smaller NSS75 for the Y gantry. The idea is X gantry has to support (and accelerate ) the Y guide and the gear. Motion specs for the 75 and 95 are the same, just the loading. In hindsight, NSS75 all round would have been fine. I went with the ’95 because they were only about 15% more . The guides come with photo-interrupter limit and home switches and cables that can be put on either side of the guide. There is 780 between the supports so the head on the Y can be quite wide (in Y) and still run full travel. They are silky smooth… I have run them up with a motor and they scared me….